Knowledge about parental quality of life (QoL) is paramount to family-centred and integrated healthcare on prematurity, but evidence is limited. We aimed to explore mothers’ and fathers’ perspectives about their QoL 4 months after a very preterm childbirth. This is a cross-sectional mixed methods study using a convergent design. Parents of very preterm infants were systematically recruited at all level III neonatal intensive care units in the Northern health region of Portugal for one year. Four months after childbirth, 61 mothers and 56 fathers filled-in the World Health Organization Quality of Life – BREF Inventory, and 26 couples were interviewed. Linear regression models were computed to assess the association between participants’ characteristics and the QoL. Qualitative data were thematically analysed. A quantitative analysis revealed that the perception of QoL was not significantly different by gender. QoL scores increased slightly from the environment (Mean (SD): 72.1 (14.2)) to the psychological domains (Mean (SD): 78.7 (14.4)). All scores were influenced by psychological characteristics. Socioeconomic position influenced both parents’ perceptions concerning the environment domain, and maternal physical and psychological QoL. Infant-related factors were associated with overall QoL among women and with the physical, psychological, social and environment domains among men. Qualitative findings indicated accommodation mechanisms that intertwine the focus on constraining factors (surveillance, sleep disturbances, non-supportive healthcare policies, hygienization) with facilitating factors (social support, accessibility/quality of healthcare, opportunities for developing parental skills). These processes were anchored in child-centredness and a framework that construct hierarchies of hope and expectations about infant’s health and development. To capture parental QoL using mixed methods raises awareness for developing intersectoral family-centred policies, integrated health services and focused-interventions to decrease the disempowering effects of surveillance and hygienization. Preterm birth is a major public health issue. Its complications constitute one of the leading causes of global deaths among children under 5 years of age , and preterm infants are at high risk of neonatal morbidity . Globally, the average preterm birth rate in 2010 was estimated at 11.1%, corresponding to more than one in ten of all births , and about 1% were a very preterm birth, occurring before 32 gestational weeks . Despite medical and technological advances, infants born very preterm remain at high risk of death and neurodevelopmental impairment, with studies revealing an average of crude in-hospital mortality rates of 14.2% in 10 European regions [5, 6]. A very preterm delivery and the ensuing child’s hospitalization in a Neonatal Intensive Care Unit (NICU) is considered a disruptive and stressful life event, affecting parental QoL via multiple pathways [7, 8], in a context with wide differences between the support to family-friendly and gender-equality policies in Western and Nordic European countries . The literature consistently shows that the quality of life (QoL) of parents of preterm infants may be compromised by sleep disturbances, fatigue, stress and psychiatric symptoms [10–14], while being protected by a stable marital union, support and information provided by medical staff, partner, extended family and other parents of preterm children [14, 15]. This knowledge is essential to develop family-centred and integrated healthcare services and policies on prematurity [16, 17], an approach with benefits for parents, children and their families [18, 19] as well as for healthcare staff and health services . However, studies exploring the intertwining of constraining and protective factors in the perception of QoL are scarce and focused on patients with chronic conditions . Furthermore, there is still limited evidence about the impact of a preterm delivery on parental QoL, in a context where methodological heterogeneity is observed regarding the operationalization of QoL and the use of units of analysis (mothers, parents, families and caregivers) . Finally, the influence of fathers’ characteristics and structural factors (e.g., parental leave policies) on parental QoL after a preterm delivery has not been sufficiently addressed in previous research . Further studies are thus needed to explore both maternal and paternal QoL, in the analysis of the individual, familial and societal factors influencing QoL. Such in-depth parental perspectives are key, especially during the return-to-work period, which is a relevant moment in countries where few attempts are being made to support parental leave [23, 24]. A mixed methods approach would provide a more complete comprehension of the QoL questionnaires’ scores, contributing to accurately capture the singular experience of parenting a very preterm infant  and the complexity of QoL assessment . By integrating quantitative and qualitative data, this study aims to explore mothers’ and fathers’ perspectives about their own QoL, 4 months after a very preterm delivery. This observational and cross-sectional mixed methods study used a convergent design aiming to merge quantitative and qualitative data into one overall interpretation, in which the quantitative results were validated or expanded with the qualitative data [27, 28]. This single-phase design (i.e. the quantitative and qualitative methods were implemented during the same timeframe and with equal weight) was chosen with the intention to best understand the QoL of parents of very preterm infants during the return-to-work period, ending up with well-substantiated conclusions about the factors that influence such phenomenon. Between July 2013 and June 2014, all mothers and fathers of very preterm infants, admitted to all level III NICU located in the Northern Health Region of Portugal (n = 7), were consecutively and systematically invited to participate in the study by the healthcare team, 15 to 22 days after delivery. Parents who were present in the NICU during the hospitalisation period, who were able to speak and write in Portuguese, and those whose single or twin infants survived were considered eligible to participate in the study . Among the 122 families invited, 96% agreed to participate in the evaluation at 4 months after delivery, the common return-to-work period in Portugal, in particular for mothers. Clinical records were reviewed to retrieve data on pregnancy complications, multiple pregnancy, and infant’s gestational age and birth weight. Extremely low birth weight was defined as birth weight bellow 1000 g and extremely premature infants were those with gestational age under 28 weeks [4, 30]. Parents were contacted 4 months after delivery to confirm the availability to receive the questionnaires at home. Parents whose infants were still hospitalized (n = 1) or died (n = 3) were excluded from the study. Self-administered questionnaires to be completed individually, with prepaid return envelops, were sent by postal mail to 113 families. Among these, 67 mothers and 64 fathers completed and returned the questionnaires between November 2013 and November 2014 (Median months after childbirth (P25-P75): 4.3 (4.0–4.6)). After exclusion of the participants with > 20% of missing values on the QoL questionnaire, as recommended , 61 mothers and 56 fathers were included in the quantitative analysis. Perceived QoL was assessed using the Portuguese version of the World Health Organization Quality of Life – BREF Inventory (WHOQOL-BREF) . It is organized into a facet of overall QoL (general perception of QoL and health) and 4 domains: physical (pain and discomfort; energy and fatigue; sleep and rest; dependence on medication; mobility; activities of daily living; working capacity), psychological (positive and negative feelings; self-esteem; thinking, learning, memory and concentration; body image; spirituality, religion and personal beliefs), social relationships (personal relations; sexual activity; social support), and environment (financial resources; information and skills; recreation and leisure activities; home environment; accessibility and quality of health and social care; physical safety and security; physical environment; transport). Data on sociodemographic characteristics were collected, as well as data regarding infants’ length of stay in NICU and the presence of health problems. Occupations were classified according to the Portuguese Classification of Occupations 2010  and grouped in three categories: upper-white-collar, including executive civil servants, industrial directors and executives, professionals and scientists, middle management and technicians; lower-white-collar, including administrative and related workers, service and sales workers; and blue-collar, which includes farmers and skilled agricultural, fisheries workers, skilled workers, craftsmen and similar, machine operators and assembly workers, unskilled workers. Unemployed (n = 15) or retired participants (n = 1) were classified considering their previous main occupation. Symptoms of anxiety, depression and parenting stress were assessed through Portuguese versions of The Beck Anxiety Inventory , the Beck Depression Inventory-II , and The Parenting Stress Index (PSI) , respectively. Participants were georeferenced according to the home address, using the ArcGIS Online World Geocoding Service and Google Maps. Each participant was matched to the urbanity level  and the neighbourhood socioeconomic deprivation, assessed through The European Deprivation Index . Missing values of the WHOQOL-BREF inventory were replaced by means of the remaining domain items, when ≤ 2 items were missing from the domains physical, psychological and environment and 1 item in the social relationships domain . Regarding the BDI and BAI scores, participants with > 2 items missing were discarded from the current analysis; the remaining missing values were replaced by the mean value for each item . Missing values in the PSI were substituted using the subscale items if no more than 5 items from total scale, 3 items from each domain and 1 item from each subscale were missing . The analysis was performed using Stata 11.0 (College Station, TX, 2009). The chi-square test and the t-test or the Mann-Whitney-test were used as appropriate. Linear regression models, stratified by gender, were computed to assess the association between participants’ characteristics and the QoL. Statistical significance was set at a value of p < .05. Semi-structured qualitative interviews were conducted with a sub-sample of 26 couples between November 2013 and April 2014. Participants were purposively sampled to include parents of infants with extremely (< 1000 g) and non-extremely (≥ 1000 g) low birth weight. A heterogeneity sampling was used for maximum variation of views and experiences, until reaching thematic saturation. Therefore, recruitment continued until no new themes emerged from the interview data . Interviews were conducted at parents’ home (n = 19), at the university department responsible for the study (n = 6) and in a private hospital room (n = 1). Interview duration ranged from 20 to 72 min (Mean: 39 min). All interviews were audio taped and transcribed verbatim. The interview guide covered the following areas: how parents deal with uncertainty and doubts and how they made their decisions concerning parental care, treatment options and uses of information sources; their views of the consent procedures; their understandings of medical facts, of technologies applied to perinatal care and of prognosis; their views of life and living with handicaps; information and communication needs of parents; and awareness of social and ethical issues in this area. Data related to parents’ perceptions of their QoL will be discussed by exploring the entire content of each interview. Thematic content analysis  was performed using the software NVivo 11 (QSR International, USA, 2015). A triangulation strategy was used to guarantee the rigour and quality of research - the first author identified, sentence by sentence, parents’ perceptions about the factors influencing (positively and negatively) their QoL after a very preterm delivery, and the last author collaborated on the development of the coding framework. Firstly, quotations with similar meanings were synthesized into categories, both deductively, in accordance with the facets of the WHOQOL-100 inventory , and inductively for the remaining data. Secondly, the categories were grouped into the following analytical themes: the domains of the WHOQOL-BREF inventory (Physical, Psychological, Social relationships and Environment)  and “Accommodation mechanisms”, corresponding to behavioural, cognitive, and emotional processes to accommodate a very preterm delivery . The re-examination of qualitative data was performed when disagreements with quantitative results were found. The most illustrative verbatim quotes were selected by two authors and revised by an English native speaker. The characteristics of the parents who completed the questionnaire and their association with QoL are presented in Tables 1 and 2, respectively. The results are explored integrating quantitative and qualitative data, according to QoL domains. A quantitative analysis revealed that the perception of overall QoL was not significantly different by gender (Mean (SD): 74.6 (12.5) for mothers; 72.8 (12.4) for fathers). Higher levels of anxiety and depressive symptoms were negatively associated with the parental perception of overall QoL. Among mothers, having higher levels of total stress, higher stress life scores, an extremely low birth weight delivery and an infant with health problems or hospitalized in NICU for 2 months or more, was associated with worst overall QoL. Based on a quantitative analysis, physical QoL was slightly higher among fathers (Mean (SD): 78.3 (13.1) vs. 75.9 (12.2) for mothers). This perception was negatively associated with higher levels of anxiety and depressive symptoms among mothers and fathers. Physical QoL was lower among mothers from a lower subjective social class and among fathers of infants hospitalized in NICU for 2 months or more. The highest quantitative score among the parental QoL domains was observed in the psychological domain among both mothers (Mean (SD): 77.2 (14.8)) and fathers (Mean (SD): 80.4 (13.9)). Lower levels of psychological QoL were associated with higher levels of parenting stress, anxiety and depression, for both mothers and fathers. This domain was also negatively associated with mother’s lower subjective social class, and with having an infant hospitalized in NICU for 2 months or more among fathers. Mothers and fathers presented similar values of social QoL (Mean (SD): 75.8 (17.9); 74.3 (16.4), respectively). This domain was negatively associated with higher levels of parenting stress, anxiety and depressive symptoms among women and men. Fathers of infants hospitalized for 2 months or more and with health problems presented lower levels of social QoL. The lowest quantitative scores on parental QoL were observed in the environment domain (Mean (SD): 72.9 (13.9) among mothers; 71.3 (14.6) among fathers). They were negatively associated with lower levels of education, having blue-collar occupations and higher levels of anxiety and depressive symptoms for both parents. Among mothers, lower scores of environment QoL were also associated with having lower white-collar occupations, a low/medium-low subjective social class, higher levels of parenting stress and higher stress life scores. Fathers of infants with health problems scored worst on environment QoL. Interviewees focused on the influence of the accessibility and quality of health and social care. Parents recognized government financial support for infant’s healthcare, namely for hospitalization, medication and vaccination, and their satisfaction with medical services as enabling factors, but pointed the negative influence of non-supportive parental leave policies and family allowance, as well as lack of coverage of “special” milk and all vaccines that preterm babies need and the absence of a “fast track” for very preterm infants in the emergency room. Other issues presented by the interviewees included constraints on their participation in recreation and leisure activities. They often referred to isolation and the absence of a “social life” as threatening their QoL. A few participants overcome these by taking advantage of opportunities to share “enjoyable” moments together, such as “watching a movie or talking to each other” (I12). A few couples also reported different perspectives regarding the home environment and financial resources by combining their negative and positive influence on QoL in a hybrid way. The need to rearrange small home spaces due to their infant’s medical needs, like “a medical oxygen cylinder” (I19), to become aware of their family’s inability to fulfil infant’s needs due to financial constraints and lack of support in transportation “for taking the infant to the clinical appointments” (I9) contributed to deteriorate QoL, while the access to conditions for creating a “calm environment” in the household and to financial resources positively affected QoL. Quantitative data suggest that mothers and fathers of very preterm infants present similar values of QoL, increasing slightly from the environment to the psychological domain. 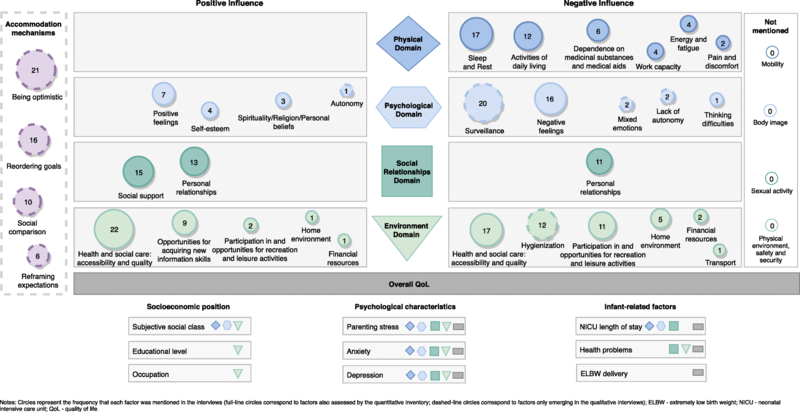 Parenting stress, anxiety or depressive symptoms negatively influence both maternal and paternal QoL, while the impact of socioeconomic position and infant-related factors (NICU length of stay, health problems and extremely low birth weight delivery) varies according to gender and QoL domains. Qualitative findings highlight constraining factors related with surveillance, non-supportive healthcare policies and the need for hygienization, and protective factors as social support, accessibility and quality of healthcare, and opportunities for developing parental skills. Participants’ quantitative assessment of QoL is comparable to the scores observed in the Portuguese general population [32, 42, 43], reinforcing previous findings showing that there are no differences in QoL between parents of very low birth weight infants and the general population . The negative association between depressive  or psychiatric symptoms  and QoL among mothers and caregivers of preterm infants has also been reported previously, as well as the influence of socioeconomic position . Moreover, the stress-buffering effects of social support  and the positive impact of family-friendly and gender-equality policies [9, 47] on QoL are widely recognized. This study adds to the literature the idea that similar quantitative scores of QoL might hide social inequalities and translate different meanings behind QoL. Figure 1 represents a comparison matrix in which a side-by-side joint display is used to converge the quantitative and qualitative data. First, each item assessed by the quantitative instrument does not acquire the same relative weight in parents’ narratives. Second, there are facets assessed by the survey not mentioned by interviewees (mobility, body image, sexual activity, physical environment, safety and security). Third, parents mention several issues during the interviews that are not addressed by the questionnaire (such as the constant surveillance, hygienization of bodies and spaces, experience of mixed emotions, and lack of autonomy as negatively influencing their QoL). Bringing together the differing but complementing strengths of quantitative methods (e.g., trends and generalization) with those of qualitative methods (e.g. in-depth description and details) in a one-phase design might thus contribute to develop a specific quantitative tool to sensitively assess QoL of parents of very preterm infants, while helps to better understand their underlying factors. When experiencing a very preterm childbirth, parents adjusted their expectations and changed their internal standards to accommodate such a catalyst event in their lives , as reported in studies with chronic illnesses patients . The accommodation mechanisms observed in this study (being optimistic, reordering goals, social comparison and reframing expectations) are anchored in child-centredness, reflecting the incorporation of intensive parenting social norms and leading to the prioritization of child’s health and well-being over parents’ QoL , and in a pragmatic framework that construct hierarchies of hope  and expectations about infant’s health status and development. Couple interviews may have limited emergence of some facets assessed by the survey, in particular those related with body image and sexual activity. Interviewed parents may have felt uncomfortable acknowledging these issues in couple. In addition, the possibility of assuming as taken for granted facets as physical environment, safety and security cannot be excluded, as demonstrated by the quantitative rates. Further studies should explore the meanings attributed to each of these facets, discussing the implications for the assessment of the QoL. These achievements reinforce the idea that the use of generic instruments may not be sensitive enough to accurately capture the specificities and idiosyncrasies of parents of very preterm infants [25, 50], overestimating their QoL. However, to acknowledge an individual holistic assessment that considers spirituality, religion and personal beliefs in QoL measurements is a step forward to improve the sensitivity of quantitative instruments, especially in health context [51–53]. Still, there is a need for further research on the development of a new quantitative tool specifically designed for being used to assess QoL among parents of very preterm infants. The use of a convergent mixed methods design is a strength of this study, in which the inclusion of researchers who have quantitative and qualitative expertise addressed the effort to offer equal weight to two type of data. The sample size and the response rate could limit the power to detect small but potentially important differences, but they are quite similar to those observed in other studies with comparable populations and objectives [14, 54]. Moreover, there are no significant differences between participants who returned the questionnaire and those who did not regarding all the assessed variables except for marital status. Participants are more likely to be married or living with a partner (92.1% vs. 82.9% among non-participants, p = .044), which could cause some bias, since married people are more likely to score higher in the QoL questionnaires than people with other marital status [14, 55]. This study raises awareness for the need to capture the QoL of parents of very preterm infants using a mixed-methods approach for developing intersectoral family-centred public policies, integrated healthcare services on prematurity and focused-interventions to decrease the disempowering effects of surveillance and hygienization. We thank all participants and health professionals for their collaboration in the study. This study was co-funded by national funding from the Foundation for Science and Technology – FCT (Portuguese Ministry of Science, Technology and Higher Education), the FEDER funding from the Operational Programme Factors of Competitiveness - COMPETE and POPH/FSE Program, under the Unidade de Investigação em Epidemiologia - Instituto de Saúde Pública da Universidade do Porto (EPIUnit) (POCI-01-0145-FEDER-006862; Ref. FCT UID/DTP/04750/2013), the project “Parenting roles and knowledge in Neonatal Intensive Care Units” (FCOMP-01-0124-FEDER-019902; Ref. FCT PTDC/CS-ECS/120750/2010), the PhD grant PD/BD/105830/2014 (MA), the Postdoc grant SFRH/BPD/103562/2014 (EA), and the FCT Investigator contract IF/01674/2015 (SS). The datasets generated and/or analysed during the current study are not publicly available due to a confidentiality agreement securing participants’ privacy and anonymity but are available from the corresponding author on reasonable request. MA, EA and SS collaborated in the acquisition, analysis and interpretation of the data. MA drafted the article. EA, MKI, AIR and SS reviewed the article critically for important intellectual content. All authors read and approved the final manuscript. The study was approved by the National Data Protection Commission and the Ethics Committee of all hospitals where the data was collected. Informed consent was obtained from all individual participants included in the study. Statistics Portugal. Portuguese Classification of Occupations 2010. 2011. https://www.ine.pt/xportal/xmain?xpid=INE&xpgid=ine_publicacoes&PUBLICACOESpub_boui=107961853&PUBLICACOESmodo=2&xlang=en. Accessed 26 June 2018. Statistics Portugal. Administrative division. https://www.ine.pt/xportal/xmain?xpid=INE&xpgid=ine_cont_inst&INST=6251013&xlang=pt. Accessed 26 June 2018.